Saudi Arabia today is a medieval system whose horrid human rights practices match its antiquated political system. Official Washington breathed a sigh of relief at the smooth transition after King Abdullah died last week. President Barack Obama is visiting Riyadh to pay his respects. U.S. officials long have celebrated their friendship with the Saudi royals, who sit atop vast oil reserves. Even more important, the American military continues to act as the Saudi royals’ bodyguard. President George H.W. Bush inaugurated the first Gulf War as much to safeguard Saudi Arabia as liberate Kuwait. He left a garrison in Saudi Arabia later targeted by the 1996 bombing of the Khobar Towers barracks in Dharan. America’s presence on sacred Saudi soil was one of Osama bin Laden’s grievances: Deputy Defense Secretary Paul Wolfowitz even justified the Iraq invasion in part as allowing Washington to remove the U.S. forces which had caused so much trouble. While American officials are conflicted by the tension between democracy and stability, the Saudis suffer no such indecision. Essentially a totalitarian dictatorship at home, the House of Saud favors whoever and whatever reduces threats to the monarchy abroad. Saudi Arabia joined the U.S. against the Islamic State. But it is an uncomfortable pairing. Many of the Sunni insurgents/terrorists likely attended extremist mosques and were educated in radical madrassas funded by Riyadh. In fact, the House of Saud for years has helped spread radical and violent Islam by subsidizing fundamentalist Wahhabi teachings at home and abroad. This theology celebrates hostility to modernity and encourages extremism and terrorism. Along with Pakistan Riyadh supported Taliban rule in Afghanistan, indirectly aiding al-Qaeda’s Osama bin Laden. The Saudi royals, whose ostentatious hypocrisy and lascivious living is evident outside of their country, have been targeted by the forces they helped unleash. So far the regime has spared no effort to suppress any threat at home. With the onset of the Arab Spring the king opened the regime’s purse strings a bit, sharing a little more of the people’s money with the people. He also introduced several micro-reforms, such as professional education for Shari’a judges. However, the Saudi kingdom remains a system of organized plunder by the royal family. Indeed, the government imposed new restrictions on dissent. The regime comes near the bottom of any international human rights ranking. A recent example of “moderate” King Abdullah’s reign is last May’s sentencing of blogger Raif Badawi to ten years in prison and 1000 lashes for allegedly insulting Islam. Saudi Arabia is as quick to behead as is the Islamic State. The main difference is that Riyadh does not target foreigners. 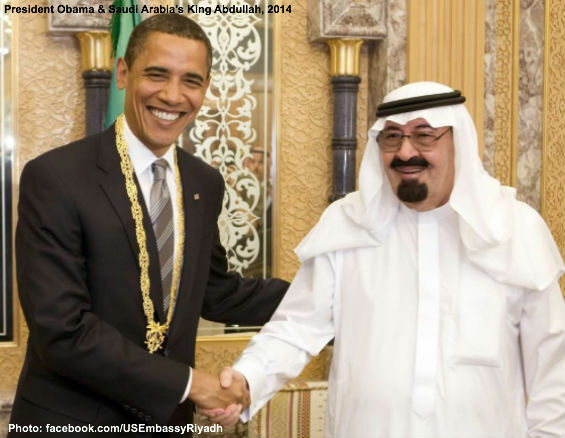 President Obama lauded King Abdullah’s “steadfast and passionate belief in the importance of the U.S.-Saudi relationship as a force for stability and security in the Middle East.” Of course. It’s cheaper to borrow U.S. troops than hire bodyguards. Riyadh’s transition offers Washington an opportunity to relax its embrace of medieval theocracy. Saudi Arabia matters internationally for one reason, oil, and that matters less in a dramatically changing marketplace. Anyway, a successor regime would continue selling oil. And the West has better answers to reliance on unpleasant suppliers, such as Saudi Arabia: drop manifold barriers to domestic energy production and innovation. U.S. support for Riyadh may not even encourage stability. The more authoritarian and corrupt the monarchy, the greater the popular resentment. At some point ruthless repression might not be enough. In an imperfect world America always will have cause to work with dubious partners like the House of Saud. However, the U.S. military’s role is not to safeguard the Saudi monarchy. Riyadh is a moral deadweight and an ally in interest, not friend in values. Washington should stop celebrating what is just another ugly pact with a foreign devil.